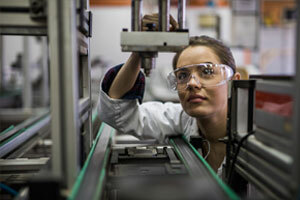 If you are the type of person who enjoys focusing on precision tasks, creating ideas, and developing new ideas and concepts for manufacturing and designing products, the role of a manufacturing engineer may be right for you. Those in this role tend to have strong leadership qualities, enjoy coordinating tasks between the creative team and engineering department, and are always looking for the next way to create an exciting, innovative, and cost-effective method for the creation and design of products. Evaluate existing manufacturing processes to identify areas that can benefit from changes and improvements. Apply working knowledge of product design and assembly to the manufacturing process. Create new processes and procedures to help the company meet budgetary goals and performance quotas. Design and develop new products and product mock-ups. Develop standardized design criteria across product lines. In order to become a manufacturing engineer, a Bachelor’s Degree in Mechanical Engineering is required. People looking to enter or progress their career as a manufacturing engineer can benefit by consulting an experienced job placement professional from Winters Technical Staffing, a leading staffing agency for the manufacturing sector in Toronto for more than 40 years. The specialists at Winters Technical Staffing can provide the guidance and support that will aid job seekers in streamlining their efforts in a more targeted and effective manner, with an overall goal of increasing the probability of landing an appropriate position. The consultants at Winters Technical Staffing have established strong relationships with employers and hiring managers throughout the manufacturing industry and have developed a reputation for success in the recruitment and placement of qualified candidates within this sector. Are you looking to initiate or progress in your career as a manufacturing engineer? The guidance and support provided by the job placement specialists from Winters Technical Staffing may be helpful to you. Call the consultants at Winters Technical Staffing today at 647-556-2408 to request your complimentary consultation.